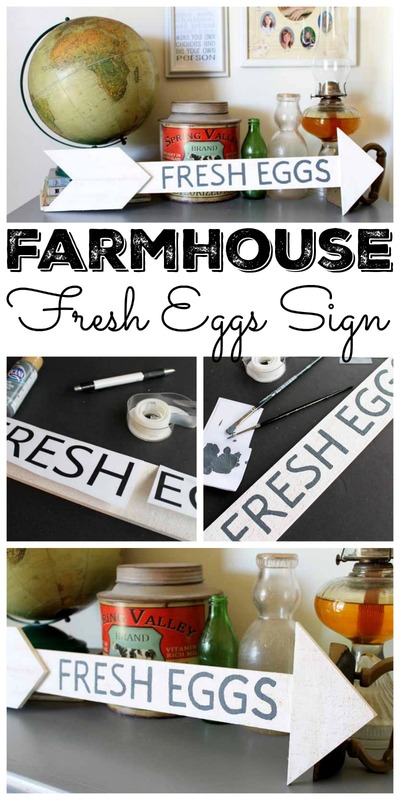 Add some farmhouse kitchen decor to your home with this fresh eggs sign. It is actually REALLY easy to make with the instructions below y’all. Grab your supplies and get started on your own version today. 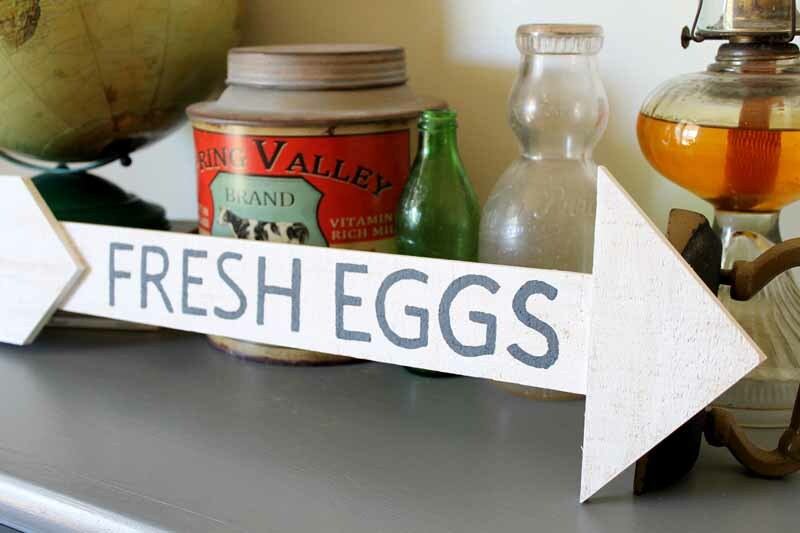 You will love the look of this rustic sign in your home. The links below may be affiliate links which means that you do not pay anymore but a portion of your purchase may go to support this site. Start by painting the arrow white with craft paint. I wanted a rustic look so I used a dry brush technique when painting. This left me with an imperfect surface where you can see the wood at times. Just right! 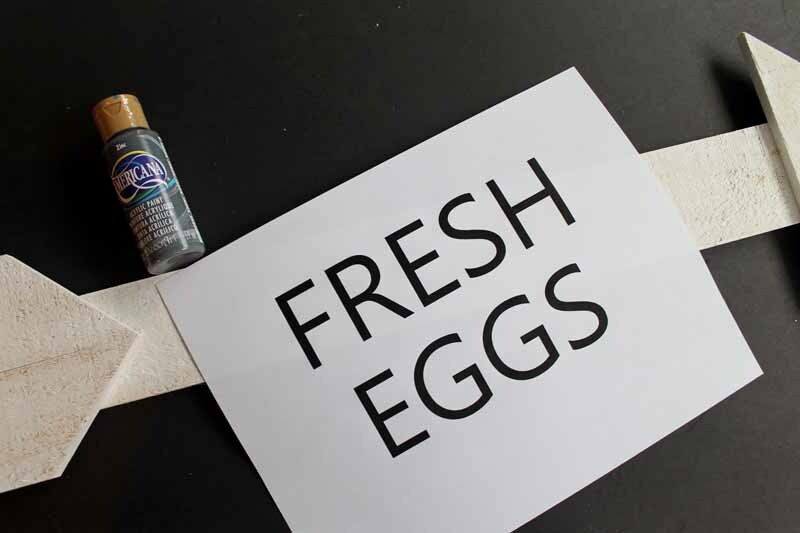 After the arrow is dry, print out the fresh eggs printable onto regular paper. Cut away any excess with scissors and tape it onto your sign in location. You can use then a few methods for transferring your words onto the sign. Use graphite paper laid under your paper and trace with a pencil. A dark line will be left on the white arrow. 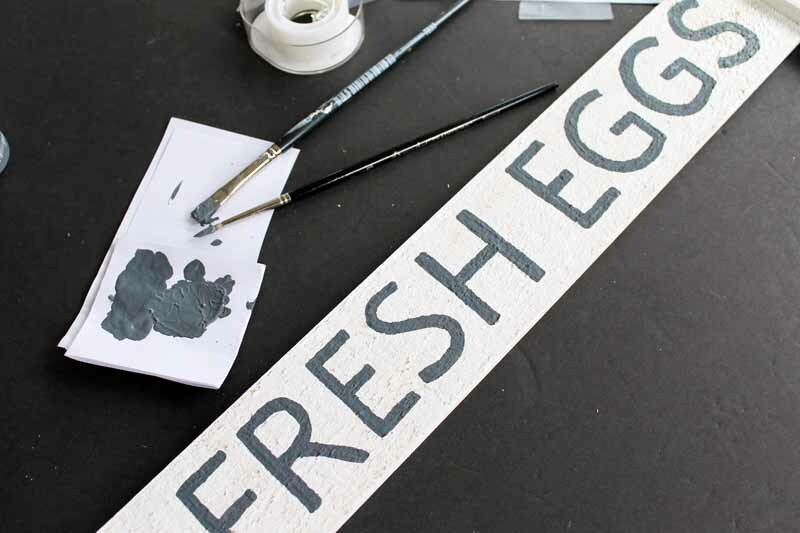 Turn over your “fresh eggs” paper and color the entire back with the side of a pencil lead. This will now act just like the graphite paper mentioned above. NEITHER! You can use a pen to go over the letters and press down hard. 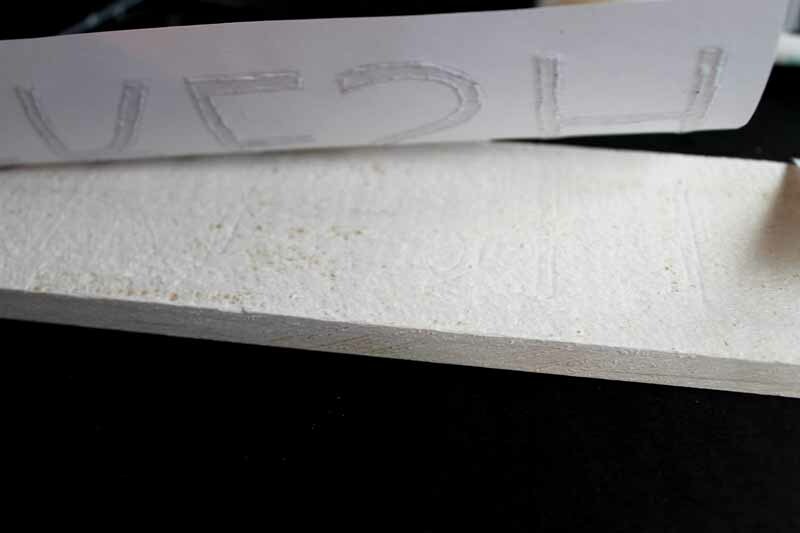 It will make a slight indention in the wood as shown below. I obviously used the indention method but any of these three will work well. Then just fill in your letters with grey or black paint. Remember that this is farmhouse kitchen decor so it is meant to be a bit rustic. So don’t get too carried away with making it perfect! I actually went over my letters a few times with the paint before they looked just the way I wanted them to. I then allowed everything to dry completely. You can also go over this with a clear spray sealer before displaying. This is important if it will be anywhere in your kitchen where it can get splattered with food, grease, or even water. 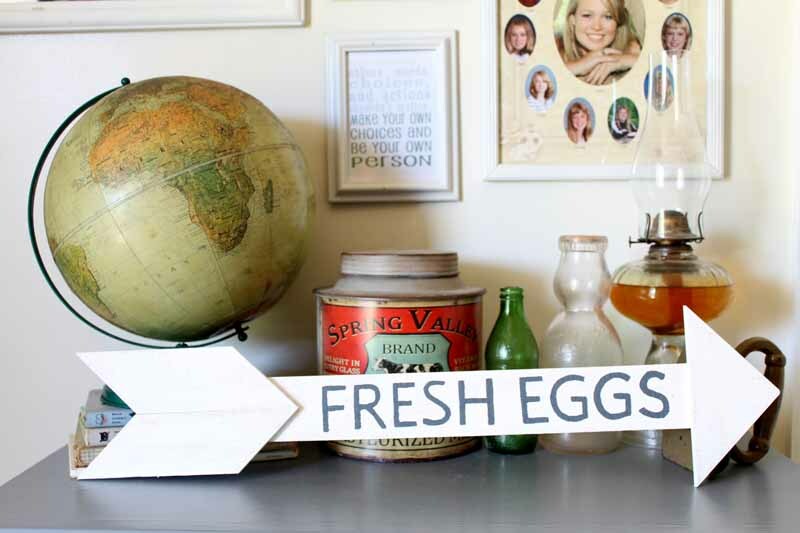 Then you can add this fun sign to your kitchen or anywhere in your home really. I snapped a few pictures in my foyer but this is actually in one of my glass front cabinets. I love the look of this farmhouse kitchen decor. Want to see more of those arrows? I stained some grey and added them as decor around my home as well. Click here to see the results. I have an obsession with these rustic arrows! So tell me where would you hang one in your home? Love this farmhouse kitchen decor and want more ideas? Click the links below! Why is it we love arrows? Ya got me. Every time would see decorative arrows at Hobby Lobby on sale thought I needed to buy them. Plus have arrow hubs made me couple years ago I use in summer for my lake/beach theme decorating. 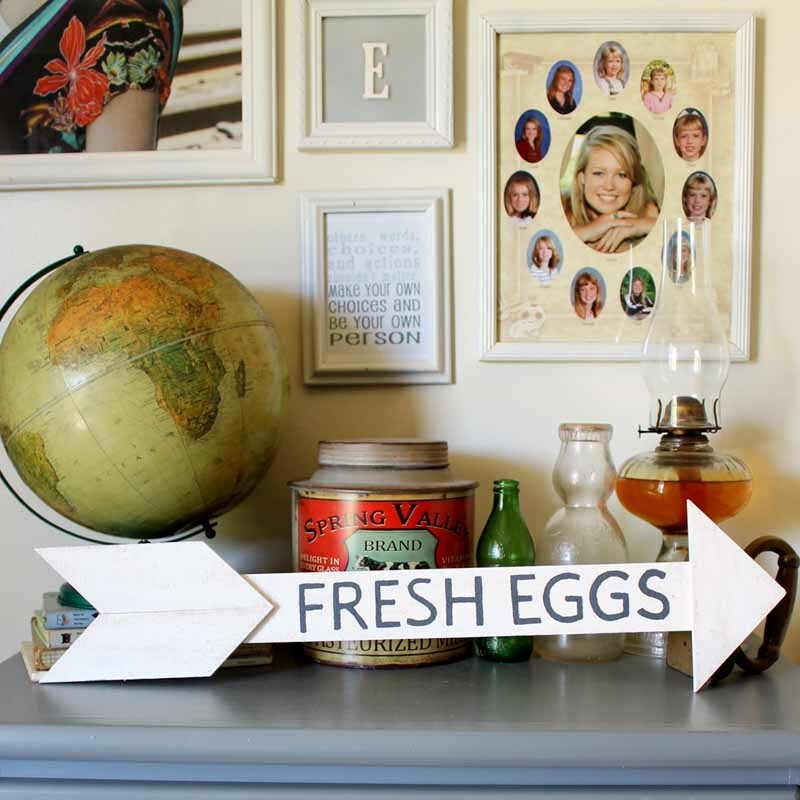 Thanks so much for eggs printable, saves me using stencils. Will get hub busy cutting pieces to make this arrow, will hang in Kitchen with all my chicken stuff. Your arrow looks great, perfect farmhouse kitchen chicken decoration. I saw one on clearance at Hobby Lobby the other day and almost bought it! I don’t even need it!! I have problems!